A few members of the AREG got together and purchased a group buy of the Waverley Amateur Radio Society Powerpole Kits to build. I got mine for my contesting setup since they were cheap and cheerful and I could screw my West Mountain Radio RigRunner under my bench. Construction of the units is not difficult and the instructions are nice and clear. A job well done by the WARS that is for certain. However with power distribution you’re always wondering just how much current can you run through them without damage. I’m luck enough to have access to the nice toys at work for testing of power supplies. 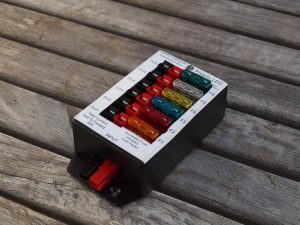 So I ran up our grunty PSU on the input, connected the load to output 6 (furthest from input) and ran up a conservative 25A continuous as the worst case and waited. The majority of my “contesting” radios will reach 25A peak with an average far lower than 25A, should be good enough. It does mean I’m not too worried if two radios were used at the same time however. Using a thermographic camera I was then able to go looking for what is “getting hot” a sure sign of something under stress. After 10 minutes of “thrashing” the temperature stabilised and I was able to capture the following two images. 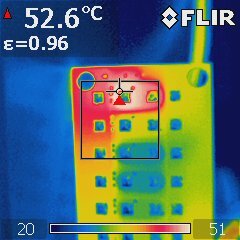 The first image showed me that there was something getting hot at this power level (345W) my initial thoughts were the copper traces or a dodgy solder joint. It turns out it’s the fuse if you look at the second image. 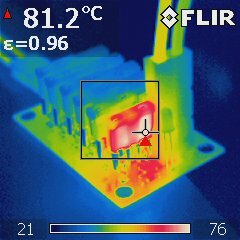 These automotive blade fuses run stonking hot at high current levels, far hotter than I’d ever considered before in the past. Keep in mind that these are 30A fuses and were 15% within their rating at the time. This stands to reason when you consider that the fusing capability of such an element is a function of the current (I) squared and time (t). So the higher the current the shorter the fusing time, the squared term ensures that the relationship is not linear. The heat from the fuse was far greater than the heat from the traces. Anyway my rough tests and thermographic images certainly tell me that a properly constructed WARS powerpole kit will happily run within it’s designed ratings of 30A continuous on the input. Time to order one or two more for the junk box me thinks ! This entry was posted in AREG, Contesting, Ham Radio and tagged powerpole, thermographic, WARS by VK5ZM. Bookmark the permalink.